than to be handsome. 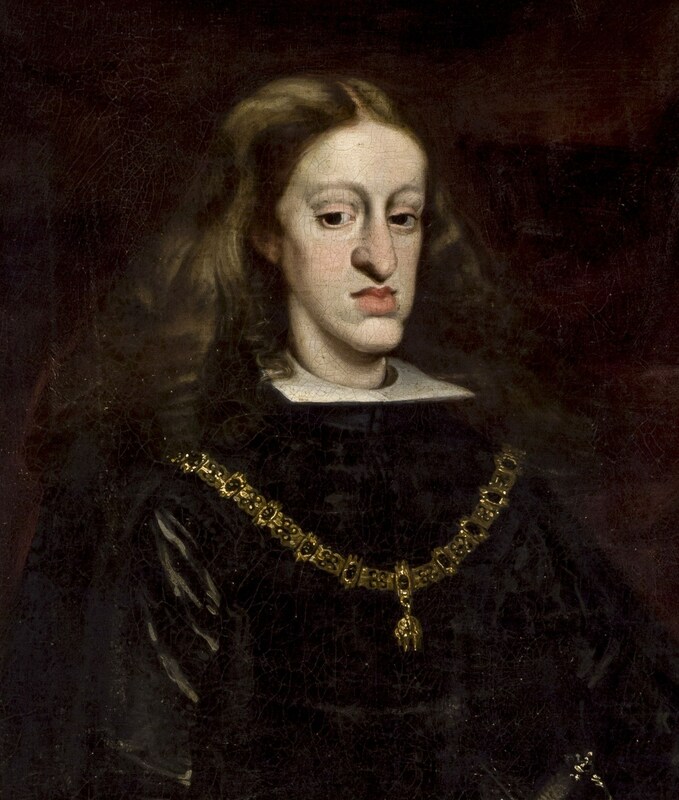 That is King Carlos or Charles II, the last Habsburg king of Spain. He reigned from 1665-1700 and he was a mess. His subjects called him Carlos el Hechizado or Charles the Bewitched and he also believed himself to be cursed. He was indeed cursed, not by witchcraft but by generations of inbreeding among his ancestors. As a result he was physically and mentally disabled. He was retarded and could not talk until the age of four or walk until he was eight. He suffered from epilepsy and his tongue was abnormally thick, making it difficult for his speech to be understood. His Habsburg Lip was so pronounced he had difficulty chewing his food. He was often ill and confined to his bed. Charles’s sad story began centuries earlier with the rise of his ancestors, the House of Habsburg. The Habsburgs began their ascent to power around AD 1000 as the Counts of Habsburg, a castle in what is now the canton of Aargau in Switzerland. Over the centuries they worked their way up becoming Dukes of Austria and various other lands, Archdukes of Austria, and finally by 1440 Holy Roman Emperors. The Habsburgs, like other noble and royal families liked to expand their holdings and gain more titles, but unlike most others, they preferred strategic marriages to gain power rather than fighting wars. This was, no doubt more humane than sending men off to be killed, but the Habsburgs ended up paying a terrible price for their acquisitions. In order to keep the lands and titles they gained by marriages, they ended up having to marry each other. The results were not pretty. The Hapsburgs gained the crown of Spain when the Holy Roman Emperor Maximilian I (1508-1519) arranged the marriage of his son Philip to the daughter of Ferdinand and Isabella ( the ones who sponsored Columbus’s voyages) Juana el Loco or Joanna the mad in 1496. As her name indicates, Joanna was indeed mad, most likely she had some form of schizophrenia, and eventually she was confined to a convent. Philip became Phillip I of Castile in 1506 and then died that same year. Phillip II married four times, including a marriage to Mary I (Bloody Mary) of England who died before producing an heir. His other three wives died in childbirth. His last wife was Anna of Austria, the granddaughter of Ferdinand I and the daughter of Phillip’s sister Maria, making her parents first cousins and her his niece . Their son was Phillip III of Spain who ruled from 1598-1621. Phillip III married Margaret of Austria, She was the granddaughter of Ferdinand I and the sister of Holy Roman Emperor Ferdinand II, making her Phillip III’s cousin. Her parents were Charles II Archduke of Austria and his niece Maria Anna of Bavaria. You may notice a pattern forming here. Phillip’s son was Phillip IV who ruled from 1621-1665. Phillip IV’s second wife was Mariana of Austria, the daughter of Holy Roman Emperor Ferdinand III and Phillip’s sister Maria Anna of Spain, making her Phillip’s niece. Her parents were first cousins. Only two of their children survived to adulthood, a daughter Maria Theresa and the unfortunate Charles II. 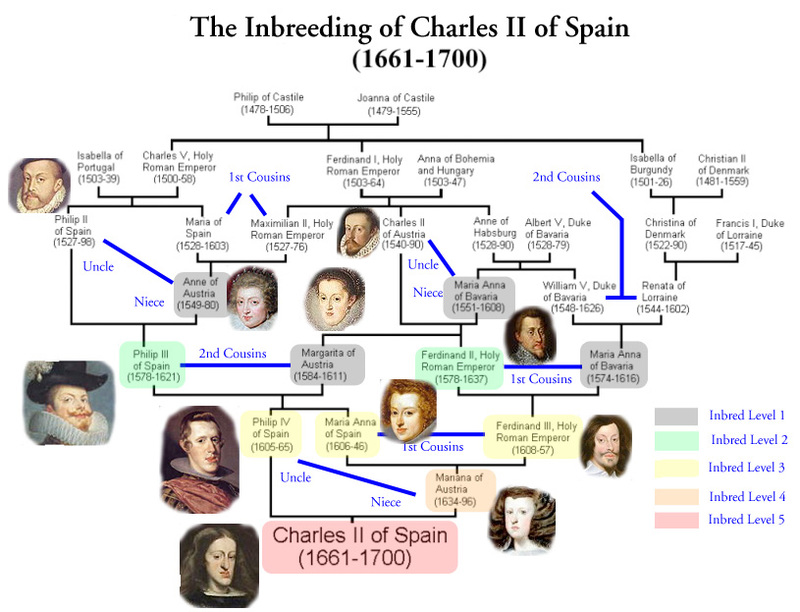 If the genealogy of Charles II seems confusing, here is a handy chart I found on the Internet that will make it all clearer. Charles II was only three years old when he became king, so his mother was appointed regent. Regencies were often difficult times in the history of most kingdoms. In most kingdoms a certain mystique about the person of the king in encouraged by his court. The king is held to be a special person, one with a direct line to the gods or God, and perhaps even divine himself. This sort of mystique helps to discourage rebellions and assassinations. The problem is that while regent may rule in the name of the king, he is not the king and cannot have the same authority as the king. As a result, while the king is a minor, the nobility begins to intrigue in ways they would not dare if a mature king were on the throne and also the regent cannot often initiate bold new policies, so the kingdom tends to drift. If the kingdom is lucky, the king will prove to be a strong leader, carefully trained in statecraft when he becomes an adult. If a kingdom is unlucky, the king will grow up to be a weak, spoiled brat under the control of his favorites. Spain was very unlucky. It soon became clear that Charles II would never be able to rule, so for thirty-five years the country drifted aimlessly at a time when the Spanish Empire was decaying rapidly and only firm, decisive policies had any chance to reverse the decline. The Spanish government was under the control of favorites of his mother Mariana, and of his two wives, yes he was married, Marie Louise of Orleans and Maria Anna of Neuburg. Neither marriage produced an heir and Charles was almost certainly sterile if not completely impotent. This may have been a blessing since any child of Charles would have inherited all of his deficiencies, but Spain was unlucky again. A king without a clear heir was certain to bring about a war for the throne. Mariana died in 1696 and Charles at last ruled without a regent. He was still incapable of governing so there was no real difference in the Spanish government. He did call for an investigation of the Spanish Inquisition just before he died and it may be that if Charles had lived longer and had been less crippled, he might have ended that institution a century earlier. Unfortunately the report that investigation produced disappeared after his death. Charles died in 1700 at the age of 38 and almost immediately after his death, the War of the Spanish Succession began. This war lasted from 1701-1714. Charles had named Philip, the son of his half-sister Maria Theresa, Philip IV’s daughter by his first wife, Elizabeth of France, as his heir. Philip was the second son of Louis the Dauphin, the son of King Louis XIV of the Bourbons. The problem was that there was the possibility that Philip could inherit the French throne and so unite France and Spain as one kingdom. No one really wanted that to happen and eventually, Philip agreed to renounce any claims to the Kingdom of France. The Habsburgs were not willing to give up Spain and had candidates of their own for the Spanish crown. There were also disagreements over how Spanish possessions in the Netherlands and Italy should be divided. No one bothered to ask the people of Spain who they might want as their king. In the end Philip got to be Philip V of Spain and a branch of the Bourbons have ruled in Spain to this day. I don’t know if there are any deeper morals in the sad story of King Charles. The efforts the Habsburgs made to keep Spain by interbreeding between the Austrian and Spanish branches of the family eventually caused them to lose it. Spain suffered under a series of increasingly incapable monarchs and for thirty-five years was effectively leaderless when leadership was badly needed. Maybe the moral of this story is that royal families should marry outside their immediate circle. Maybe a system that encourages such inbreeding is not a very good one and we are well rid of it. Maybe little girls should aspire to something more meaningful than being princesses.